The high-voltage legal battle between Ambani brothers in the Supreme Court on Wednesday witnessed a dramatic twist with Justice R V Raveendran withdrawing himself from it while another judge recused from a case involving Mukesh Ambani firm RIL. Justice B Sudershan Reddy will take the place of Justice Raveendran in the three-judge Bench headed by Chief Justice K G Balakrishnan, which will hear the case afresh from Thursday. As the gas row between the brothers entered the third week of hearing today, Justice Raveendran recused from hearing the matter on the ground that his daughter is a partner in a solicitors firm advising Mukesh Ambani group on other projects. The judge said he came to know only on Tuesday that law firm AZB Partners in Bangalore with which his daughter Sunitha Rajesh is associated since September 1 this year is advising the Mukesh Ambani group in other projects. "I am recusing myself from hearing this matter since I came to know only yesterday that my daughter is associated with a solicitors firm which is advising one of the parties in other matters relating to projects of global acquisitions," Raveendran said when the matter came up. In an unrelated matter, Justice Markandey Katju, who was a part of the Bench which heard the dispute between RIL and state-owned Bharat Petroleum Corporation Ltd (BPCL), recused himself after reserving the judgement in September, saying that his wife held shares in RIL. Justice Raveendran, who held equal shares of both RIL and Anil Ambani's RNRL, which are pitched in a legal battle over the supply and pricing of gas from the KG Basin, had offered to recuse when the hearing had started on October 20. However, when none of the parties objected, he continued to be the part of the Bench and heard the matter for six days. RNRL is seeking gas from RIL at rates 44 per cent lower than government-approved price. RIL says it cannot honour the commitment made in the 2005 family agreement due to government's pricing and gas policies. Justice Raveendran said, "The issue is my daughter is associated with a firm which is advising one of the parties in another project and I would not like to hear the matter". The judge said even though his daughter is in no way involved in the matter, his concern is that the "credibility and confidence" of the institution is maintained. "My conscience is clear and I feel that justice should not only be done but should seem to be done. That is the tradition of this court," he said. "I am sorry that six days of valuable time of this court has been wasted," he said adding, "I wish that somebody should have brought to our notice earlier about my daughter's association with the firm." 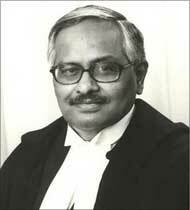 Justice Raveendran, while recusing himself, said "till now only RIL was advancing the arguments and RNRL has not started. So it is not late to dissociate myself from hearing the matter." Later, when he was asked by reporters on the sidelines of a function why he had done so, the judge said "whatever I had to say, I have mentioned it in the court. I have no further comments to make." When the matter came up in the court, senior advocate Ram Jethmalani, appearing for RNRL, urged Justice Raveendran to continue with the Bench as the hearing on the dispute has gone for several days. Jethamalani was joined by Additional Solicitor General Mohan Parasaran, who said that Government has full confidence in Justice Raveendran and would like him to hear the matter. RIL's counsel and senior advocate Harish Salve also shared the views of Jethmalani and ASG and said though there has been relentless media pressure, Justice Raveendran should ignore it and hear the matter. However, Justice Raveendran declined the request, saying he has no option left but to recuse himself from hearing the matter. He said only one side has started the arguments. "The only silver lining is that the other sides have not started arguments and since this information has been received at a time when Salve has not completed (arguments) I am left with no other option but to recuse myself from the hearing"
"Even though both parties have no objection, I don't want to hear the matter. A different view would percolate down to the citizens since this is a high-profile matter," the judge said. Both Salve and Jethmalani told the Chief Justice that he along with Justice P Sathasivam can continue hearing the matter. However, the CJI said, "In the begining I had said that this matter should be heard by a three judge bench. The court will hear the matter afresh by constituting a new bench from tomorrow. RIL said that it would complete its arguments by November 12.